The ordinances pertaining to the operation of small scooters (or mopeds) on public roadways have actually been made less restrictive. 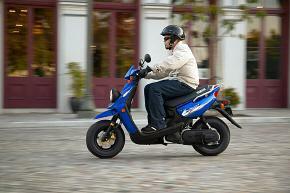 Mopeds are defined as every vehicle that travels on not more than three wheels in contact with the ground that has (1.) a seat that is no less than 24 inches in height, measured from the middle of the seat perpendicular to the ground and (2.) a gasoline, or hybrid motor that displaces less than 50 cubic centimeters. While operating upon a public street or highway the driver must obey all traffic laws. While operating a moped on the highway the operator is required to ride as close as practical to the right curb/edge of the roadway. All persons riding on a moped are required to wear protective helmet and safety glasses of a type approved by Superintendent of State Police. No Moped shall be driven on any highway or public vehicular area faster than 35mph or by any person under 16 years of age. No moped shall be used to carry more persons at one time than the number of persons which were designed or equipped. When operating between the hours of sunset and sunrise, it must be equipped with a headlight and a red rear reflector visible at night. Anyone operating a moped faster than 35mph is considered to be operating a motorcycle, which subjects the operator to the same traffic laws that govern motorcycles. All operators are required to carry some form of identification with them at all times which includes their name, address, and date of birth.